Less than a week after he assumed office, Trump signed an executive order that called on US Immigration and Customs Enforcement (ICE) and other federal agencies to “unapologetically enforce the law, no ifs, and's or buts” when it comes to immigration, according to White House press secretary Sean Spicer. Trump signed a second one on February 22 that sought to “take the shackles off” immigration officers to speed up deportations. Since then, federal authorities have carried out multiple raids on and deportations of illegal immigrants. In some cases, though, a hastened deportation would actually be an injustice to the courts of law. A district judge in Denver, Colorado raised the bail for an illegal immigrant charged in a fatal hit-and-run to $1 million on Thursday, all to make sure that he wouldn’t be deported before trial. Norlan Estrada-Reyes, 27, is accused of killing a woman and fleeing the scene, a class 3 felony. He has already been deported back to his native Honduras once, in 2007, before illegally returning to the US. Estrada-Reyes had already been arrested twice in the Denver area before the October 30 car accident. He turned himself into authorities on November 3, and was charged with hit-and-run involving death, driving without proof of insurance and careless driving resulting in death. Two days later, immigration agents interviewed him and issued an immigration detainer. On November 11, Estrada-Reyes posted bail to the tune of $20,000. In early December, he was arrested by Immigration and Customs Enforcement (ICE) officers and charged with illegal re-entry. On Monday, he pleaded guilty to that charge, was sentenced to time served ‒ 45 days in jail ‒ and was placed in ICE custody pending deportation, the Denver Post reported. Brimmer wasn’t to have the last word, however. On Thursday, Denver Chief Deputy District Attorney Julie Hill asked for bail in the hit-and-run case, which Estrada-Reyes had already posted, to be raised to $1 million. “We have an absolute guarantee that if there is not a high enough bond in this case, ICE will not transfer him to Denver’s custody,” she argued. District Judge Shelley Gilman agreed and ordered the bond to be paid in cash, saying she has seen “enough cases” where defendants were not tried because of deportation, according to the Denver Post. It’s not the only time recently where a judge has gotten in the way of deportation plans. Unlike the Colorado case, where ICE officials had sought for Estrada-Reyes to remain in custody, a judge in Multnomah County, Oregon is accused of helping an illegal immigrant escape from custody. "I prepped my client. I said, 'I don't know if they're going to pick you up outside or what, but here's how to prepare,'" said lawyer John Schlosser. "After the court appearance, I went out in the hallway and sat. My client never came out. I can't say that I'm surprised he didn't come out, but I gave him his options, and assume he had to have been escorted out some other way." Pacheco Salazar appears to have slipped out a courtroom door reserved for employees. Now the court referee on the bench that day, Judge Monica Herranz, is facing an internal investigation for her alleged role in the escape, Chief Judge Nan Waller told KPTV on Tuesday. ICE agents met with US Attorney for Oregon Billy Williams and representatives from the Department of Justice's Office of Professional Responsibility to discuss the case, but ultimately decided not to pursue a criminal investigation or bar complaint against Herranz, the Willamette Week reported. Two weeks after his escape, immigration agents arrested Pacheco Salazar at a follow-up hearing. He is currently detained at a privately-operated ICE detention center in Tacoma, Washington. Schlosser has not been able to contact his client there, however. In a twist, one attorney is seeking to use Trump’s immigration orders to help his client be deported. 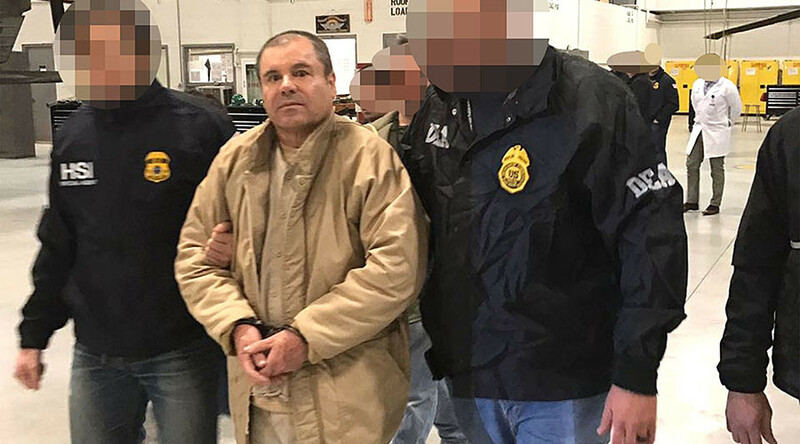 That client is none other than notorious drug lord Joaquin “El Chapo” Guzman, who was extradited to the US from Mexico in mid-January. Lawyer Jose Luis Gonzalez Meza believes that Mexican prosecutors violated due process by extraditing Guzman, he told reporters outside the Mexican Attorney General’s Office on Wednesday. "That means he is in the United States illegally," said Gonzalez Meza. "We are going to ask he be returned, because he is illegal and criminal!" He also held up a banner that read: "Mr. Trump, Deport the illegal and criminal Chapo Guzman," AP reported. Mexico is a far more appealing place for El Chapo to serve time, after all, since he has a history of escaping from their prisons.